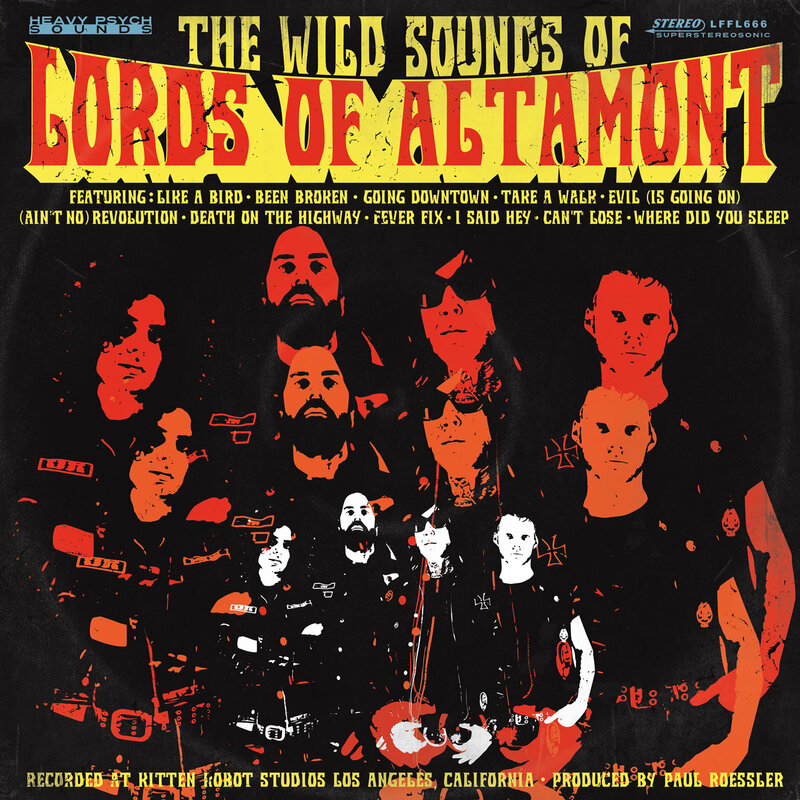 Los Angeles rowdiest rock’n’roll revelers THE LORDS OF ALTAMONT are ready and steady to unleash their sixth album « The Wild Sounds Of Lords Of Altamont » this October 6th on Heavy Psych Sounds. Let’s welcome the L.A combo back and hit the road to rock’n’roll with them ‘Savage 4’ ! Let the turntable roll and the record spin with The Wild Sound of Lords of Altamont, carefully produced at Kitten Robot Studios in the City of Angels by punk rock legend Paul Roessler (former Screamers member) and analog-mastered by Dave Schultz at D2 Mastering Lab! A hammered 4-stroke beat like a twin cylinder engine running on idle, a roaring guitar riff revving up the rpms of the iron-built motorcycle-inspired band, then the fresh and insisting breeze of a Farfisa organ whispering ‘let’s ride’ and a heavy bass greasing up the reliable crank and rods of that authentic rock’n’roll machine, and there goes, ladies and gents, the mighty LORDS OF ALTAMONT combo! Riding hard on backyard-built, loud pipes and rigid frame undestructible raw choppers, the band left their garage enlivened by the year of 1969, right at the crossroads of the Summer of Love and the birth of punk rock. Fueled up by the MC5, the Stooges and the Chambers Brothers to name a few, the pack follows Jake ‘The Preacher’ Cavaliere (vocals, organ) on his uncompromising rock’n’roll journey ; Dani Sindaco (gtr), Rob Zimmermann (bass) and Steven Van Der Werff (drums) along with their frontman are now spreading out The Wild Sound of Lords of Altamont, their latest record, around the planet! Through fads and fashions, either on wax or on stage, the Lords can take you back to this era of freedom and rebellion with their hi-octane tunes. The gang has been already rocking the world for 17 years with spectacular performances, firmly run-in by 5 solid stainless records and they’re now fine-tuned with this new release of 11 powerful late-sixties tracks which manage to sound fiendishly contemporary! Our era needed the Heavy Psych Sounds and the Lords real bad: ten new original stunning songs plus an arrogant and totally mind-blowing Howling Wolf cover (‘Evil is Going On’) will be available this October 6th on limited black vinyl, CD and digital format! BLACK MOTH unleash the video for « Tumbleweave » via Terrorizer; new album « Condemned To Hope » out September 15th. Final day splits for DESERTFEST LONDON are up; day tickets on sale now.